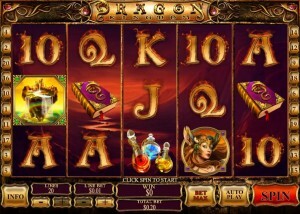 Dragon Kingdom comes from Playtech and it’s a beautiful slot machine, themed around dragons and the fantasy genre. With flying castles being part of the story and used in the symbols, with warriors, spell books and potions all present, you’re going to discover that it’s a game unlike any other. Though fantasy and dragons have been used as inspiration plenty of times in the past, none are quite the same as Dragon Kingdom. 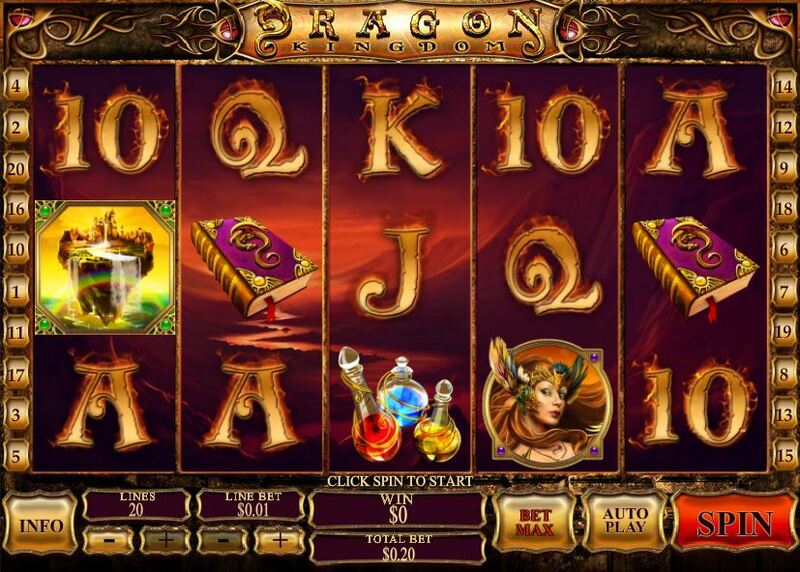 Prizes in Dragon Kingdom can get to a high value, offering as much as $1,250,000 in theory. They do this when on one of the 20 lines combinations of six symbols form, with the help of a Dragon Split feature. Free games, scattered Flying Castles and wilds are the other great features you will encounter along the way. The theme and the design aren’t the only ones that are special here. 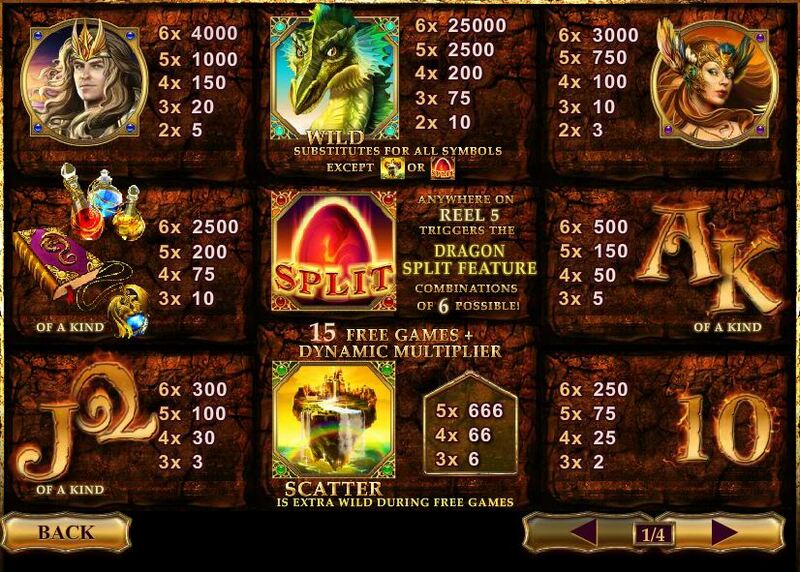 You will also find a combination of wild symbols, scatters, free games, dynamic multipliers and bonus games. They all conspire to make this game a very interesting and fun choice. You will find that the wild symbol’s image is that of the Green Dragon himself. This symbol is ca very rewarding feature, both because it can substitute for symbols and because it awards the slot’s jackpot if you’re lucky. An incredible 25,000x is the jackpot which is offered when five wilds manage to create a combination on the same line, with a Dragon Egg present on the 5th reel that round. As a wild, the Green Dragon is capable of substituting for other symbols, as long as they’re not special features. The first scatter symbol is the one with the Flying Castle, an impressive sight. The symbol both gives you big prizes and triggers the free spins. The prizes are available when you have a minimum of three scatters present in any position, and they give you up to 666 times the triggering bet. 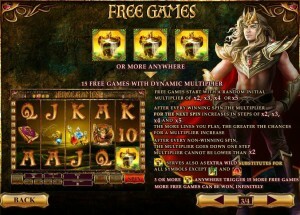 The same 3+ scattered Flying Castles will offer you access to the slot’s free spins. 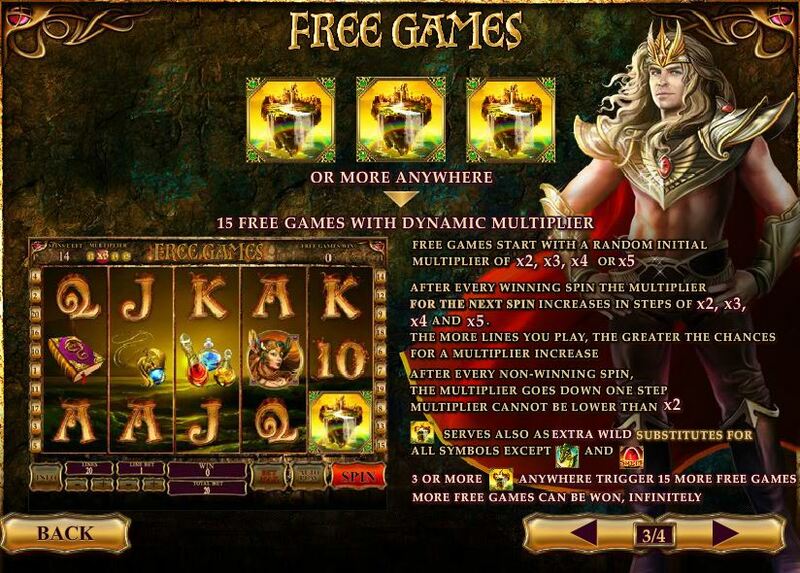 You will be offered 15 spins for free and dynamic multipliers will be used alongside. The Flying Castle scatter is an extra wild for the duration of the free spins, but it can still retrigger the free spins if 3 or more are present on the reels. You start off with multipliers that vary between 2x and 5x. Each time you get a win, the multiplier goes up for the next spin, by 2x to 5x. If you have a spin without a win, the multiplier goes down, but it doesn’t go lower than 2x. The presence of the Dragon Egg, in any position on the 5th reel, will trigger a feature which splits the last symbol of a winning combo into two symbols. What this means is that instead of having a combo of three, you will have one of four and a bigger payout. Combos of up to 6 symbols become possible with the help of this innovative feature. It’s how you can get the largest possible prize, of 25,000x. Wagers can be as cheap or as expensive as you want them. The minimum denomination for a coin is $0.01, while the maximum is at $50. With a maximum of 20 available lines, the bets can get as high as $1,000. 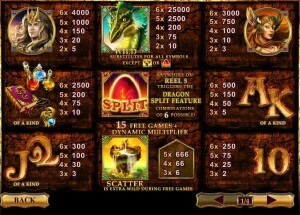 In exchange for that big maximum wager, the slot offers payouts of up to 25,000x, or $1,250,000. You need six symbols though, five wilds on the same line and a Dragon egg on the 5th reel. A desolate land is visible behind the transparent reels, colored in red and looking like it’s the result of a volcano eruption. On the reels, you have a lot of playing cards which are on fire, plus various fantasy related images, like the warriors, the potions, flying castles and dragons. The game looks medieval, with bronze being used in the construction of the outer area of the game. Fans of the fantasy genre will enjoy it. Symbols: Green Dragon (25,000 coins, wild), Dragon Egg (scatter), Flying Castle (666x the bet, scatter), Warrior Prince (4,000 coins), Warrior Princess (3,000 coins), Potions (2,500 coins), Spell Book (2,500 coins), Necklace (2,500 coins), Ace (500 coins), King (500 coins), Queen (300 coins), Jack (300 coins) and 10 (250 coins). It’s an incredibly generous game, though only when the new feature called Dragon Split is active. Otherwise, you get about one tenth of that maximum prize. Still, the slot has a lot to offer, both design and prize wise. 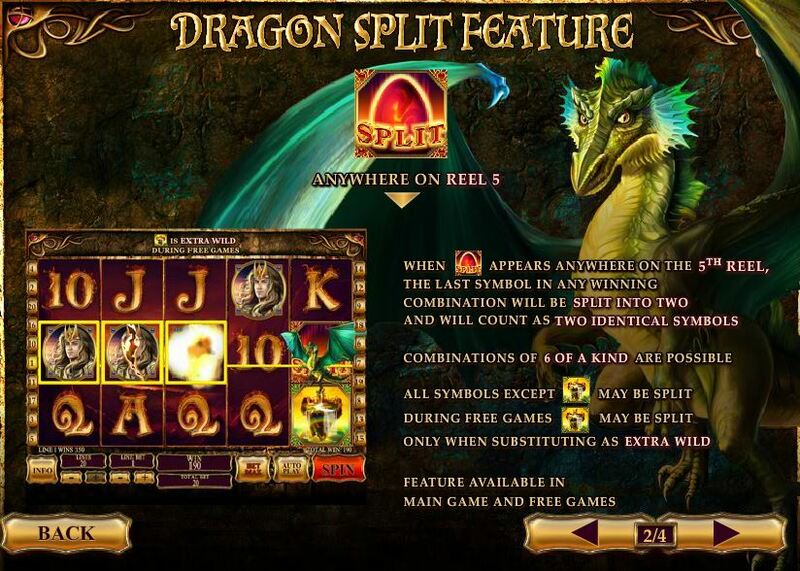 This Dragon Kingdom slot is offered by all online casinos with Playtech software, playable either in practice or in real money mode.